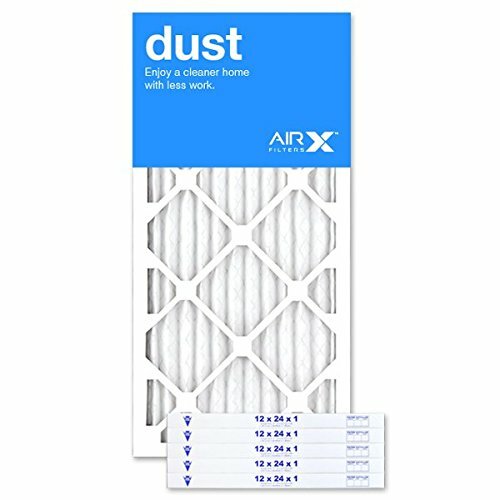 AIRx Filters MERV 8 12x24x1 air filter provides protection for your heating, ventilation and air conditioning (HVAC) system, keep your home a little cleaner by removing nuisance particles such as lint, dust, pollen, dust mite debris, and mold spores. AIRx Filters 12x24x1 air filter's ability to remove these nuisance particles makes it applicable air filter better for homes, and fit for industrial commercial workspaces. Moisture resistant double-wall beverage board material inhibits mold and mildew growth due to moisture. Constructed with a sturdy 30 gauge galvanized expanded metal grid supports the filter. AIRx Filters MERV 8 12x24x1 air filter is capable of working in 180f (82c) continuous service, peak 225f (107c) maximum temperature and resistant to 100% r.h. maximum humidity. Indoor air remains healthy when the air filter is replaced once every three months or sooner if the indoor air includes a large quantity of contaminants.